Online registration for the in-person conference is now closed. You may register on site in Cincinnati. To register for the virtual conference or to add the virtual conference to your in-person registration, click here. Conference rate hotel reservation information: $162/night plus tax. The conference rates has now ended. If you have any questions, email us at [email protected] Please put “conference inquiry” in the subject line. If you have questions about sponsoring and/or exhibiting, please click here. The conference app provides up-to-the-minute information such as the latest agenda, updates from the conference planner, speaker information, feedback opportunities, maps, sponsor details, and an attendee list. The App also includes new features that allow for connecting with fellow attendees, coordinating dinner groups, coordinating SRO groups, and finding activities to do around town. Closer to conference, there will be a chance to volunteer as a moderator via the app by choosing the sessions you want to moderate. The Conference hotel is the Hilton Cincinnati Netherland Plaza, 35 West Fifth Street, Cincinnati, Ohio, 45202. The conference group rate is now closed. Conference rate hotel reservation information: $162/night plus 17.5% tax. The room block closes August 25, 2017, or until the block is filled, whichever occurs first. Guest room rates will be available three days pre and post based on availability. The Hilton Cincinnati Netherland Plaza is located in the heart of downtown Cincinnati at the corner of Fifth and Race Streets. It is easily accessible from Interstates I-71 and I-75. The hotel’s luggage, valet and self-parking options are on the left side of Race Street between Fifth and Fourth Streets. Please use 418 Race Street, Cincinnati, OH 45202 for your GPS destination (please note: this is not the hotel’s mailing address). Discounted rates are being provided by Executive Transportation (www.executivetransportation.org). Rates are $24/one way or $32/roundtrip. Make sure you mention that you are with the National College Testing Association to get these rates. Offer you the opportunity to talk to one of our Airport Executive Shuttle agents located in the baggage claim area. If you are driving to the hotel, please click here for turn-by-turn directions. 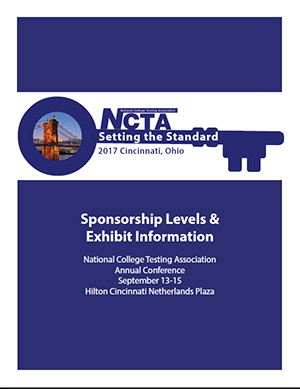 I would like to cordially invite you to participate as a sponsor of the 2017 NCTA Conference September 13-15 at The Hilton Cincinnati Netherland Plaza in Cincinnati, Ohio. Last year’s conference in Seattle, WA, attracted more than 400 testing professionals from across North America. In addition, our third virtual conference with its expanded number of offerings was a huge success, drawing several hundred additional participants. We look forward to continued expansion in both areas this year. Regular registration closes on August 25, 2017, at midnight EST. After that, only onsite registration will be available; the onsite fee includes an additional $75.00: a total of $375.00 for members and $450.00 for non-members. If you are registered as a full-time attendee and would like to bring a guest to the meals, you may do so by purchasing individual tickets for your guest. Guests may not attend sessions or other conference events. Guest meals must be purchased in advance. You do not have to pay at the time you register for the Conference, but to get the reduced fees, you must register within the dates listed for each fee. All conference registration fees, whether early bird or regular, must be received by August 25. Any registrations which have not been paid by that date are subject to cancellation. GUEST MEALS: The registration and payment for Guest Meals is available on a separate registration form. Fees for Guest Meals are non-refundable. OVERPAYMENT REFUND POLICY: Errors made that result in an overpayment will be subject to a 10 percent penalty charge prior to any refund. Refunds will be issued after the conference. 75% of the registration fee, less a $75 processing fee, will be refunded if a written request is postmarked no later than July 16, 2017. 50% of the registration fee, less a $75 processing fee, will be refunded if a written request is postmarked no later than August 25, 2017. No refunds will be issued after August 25, 2017, however a change to attend the virtual conference can be requested, see below. Conference registrations may be changed to a virtual conference registration free of charge. This will not include a refund of registration fees. To do so, a written request must be postmarked August 25, 2017. The name of the conference registrant can be changed, for a $25 fee. To move the conference registration to another name, an email must be sent (with the names of the current and intended registrant) no later than August 25, 2017 to [email protected]. PAYMENT INFORMATION: Payment can be made by credit card or check. If paying by check, please mail your payment (payable to NCTA) and a copy of your registration confirmation to . Neither cash nor purchase orders will be accepted. Click here to register for the virtual conference. Pricing information for the 2017 Virtual Conference (2 days/8 sessions) is identified below. Any purchase of the Virtual Conference, whether as an add-on or not, allows the registrant to invite others at no additional cost to view the sessions either live or at a later date. The virtual conference sessions serve as the perfect opportunity for professional development for you and your staff. Virtual Conference Sessions click here. In our classrooms and testing centers, Generation Z students have replaced Millennials on college campuses. Far more than just hyper-versions of their Millennial predecessors, this new generation will bring a new set of characteristics, perspectives, motivations, and concerns with them as they enter and navigate college. The way we work with Generation Z students must be reflective of their unique generational identity. This session breaks down what we know about Generation Z and presents considerations to develop strategies to best work with Generation Z students on the college campus. Meghan Grace is the co-author of the book, Generation Z Goes to College. She has experience in program management, leadership development, curriculum development, and assessment. 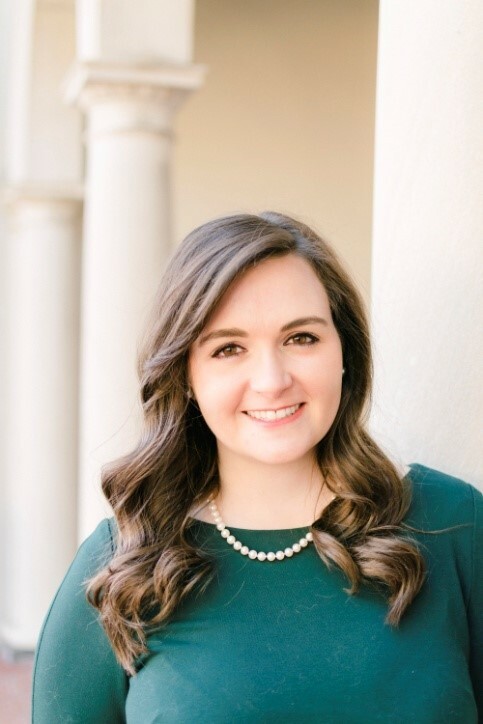 Meghan previously worked as the Director of Undergraduate Programming & University Partnership for Sigma Phi Epsilon's Headquarters staff and as a Coordinator for Leadership Programs at the University of Arizona. She has served as an instructor for courses in leadership development, social entrepreneurship, career preparedness, and event planning. Meghan completed her undergraduate degree at Chapman University and her master's in higher education at the University of Arizona. She is pursuing her doctoral degree at Vanderbilt University studying higher education leadership and policy. Our workshop is by Invitation Only for our Test Administrators that deliver ETS test in their current testing environment. The information pertains to ETS testing programs, updates, changes and new information. Out with the old and in with new…don’t miss our special session to see the new rebuild and release of the new and improved features in SmarterProctoring. Sean Doty, Engagement Manager and Jason Fill, CTO (product architect), will be highlighting some benefits of our proctoring management system. The new design is user-friendly and intuitive, seamlessly integrates with the LMS, and continues to organize and manage all proctoring tasks viewable on a convenient dashboard. RegisterBlast is excited to release our new Accommodations module. This product is designed to be an end-to-end solution for disability services departments to enroll and track students throughout their time at a school. It is fully integrated with our core scheduling functionality. Students' needs for extra time, special equipment or locations, breaks, etc. are accounted for without requiring testing staff to individually interact with the accommodated students. Sign-up instructions: Email [email protected] if you plan to attend the workshop. Tailwind Placement Exams combines over 40 years of placement testing experience from the University of Wisconsin System with the unparalleled test delivery engine and customer service of Castle Worldwide. At Tailwind, our unique combination of applying rigorous psychometrics to exams that are developed for faculty, by faculty allows us to provide campuses with high quality assessments that are valuable to the placement process. With a comprehensive, 3-in-1 mathematics exam, a combined Reading and Writing exam, and exams in three foreign languages, Tailwind Placement Exams offer a complete placement package for colleges and universities. Come learn more about the Tailwind advantage! This will be a unique opportunity to hear directly from Castle’s Chief Technology Officer, Bryan Reel, regarding the existing and future landscape of the technology that facilitates the testing industry. Bryan’s experience building highly secure systems with the Department of Defense prior to arriving at Castle 7 years ago has guided his team in their approach to building and enhancing Castle’s technology platform. We hope you enjoy this behind-the-scenes look at the test delivery infrastructure within the testing industry and what drives Bryan’s team to be a preferred technology partner. Come and learn why Castle’s single-platform technology system provides testing organizations with a considerably greater level of reliability and system up-time. GED Testing Service’s commitment to provide a quality testing experience to adult learners is successful because it is aligned with our commitment to partner with test administrators and adult educators. In this session, we will review results from a recent survey by our GED Testing Service Technology Operations Team and as well as key tips for test-taking. In addition we will review changes to our GED Analytics data tool that allows for a wider audience to access this valuable tool as well as our new Class Proficiency Report and a review our GED Manager system. Participants will interact with recently developed tools and resources to support their work to guide the adult learner to a successful outcome and have greater access to aggregate data specific to your program. If people are our greatest resource in business and in work, then communication is our most critical asset---the essential component driving our human needs, wants and demands. As administrators, we coordinate testing activities with proctors who in turn schedule clients seeking credential-based testing opportunities. These same clients engage with teachers, faculty members, and administrators. Add vendors and companies as well as managers, subordinates, and colleagues to the mix and you have a hectic world where upward, downward and lateral exchanges are facilitated at the speed of light. No matter how distinct or different our roles, communication through social media and emails brings us even closer together. However, at a moment’s notice, our utopia could be shattered by vague instructions, an incomplete text or email, an ill-advised response to message transforming our world of efficiency, productivity and mutual respect into a place of hostility, ineffectiveness, and ambiguity. 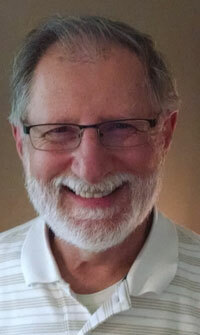 Our capacity to inform, direct, lead and inspire could decline in an instant. People are speaking but are we listening? Are we really communicating? If it can happen to us, then what about the rest of the world? Join us as we explore the power of engagement as we learn and develop The Art of Communication. Socialize with your colleagues and explore the Exhibitors’ fair while eating metts & brats, chili dogs, and pretzels. Prizes, photos and fun are all included! Socialize with other NCTA members while enjoying the local cuisine. Sign up sheets will be located at the Hospitality table. Once again, the NCTA conference coincides with an MLB game — actually two ball games — the Pittsburgh Pirates vs. Cincinnati Reds on Friday and Saturday night. Although NCTA is not reserving a block of seats, on Friday night we are recommending members reserve seats in section 408-410. Tickets in this section are only $15 and include your first drink, (click here for more information) or you can upgrade to an Oktoberfest ticket package that includes drinks at the game and a commemorative mug (click here for this package). For more information, please go to the Reds website. On Friday, America’s largest Oktoberfest kicks off in Zinzinnati. The first event is the Running of the Wieners. You really don’t want to miss it! For more information, click here.